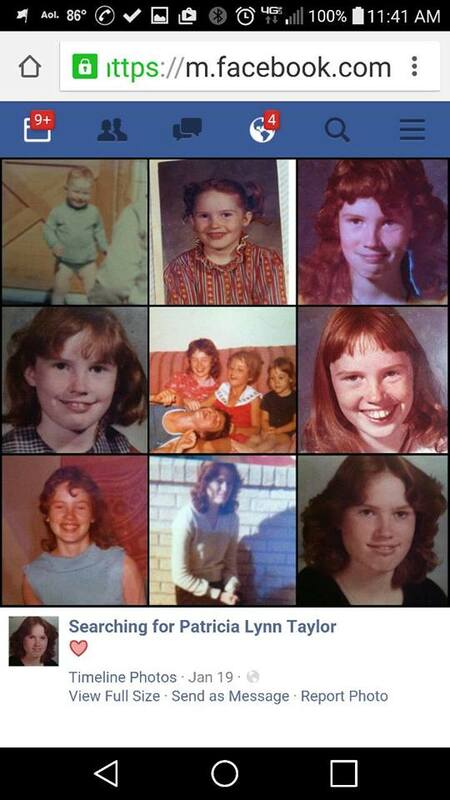 “Patty was born Patricia Lynn Taylor on November 23, 1965 in California. Patty’s home situation was not the most ideal and out of concern for her safety Patty was sent to live with relatives in Grand Forks Air Force base in North Dakota. After six short months she was taken back to Oklahoma and left with a children’s home in El Reno, OK. From there it is believed that she possibly went to Whitaker Children’s Orphanage in Pryor, Ok, then to Lloyd E Rader in Sand Springs, then to Owasso Children’s Baptist Home. 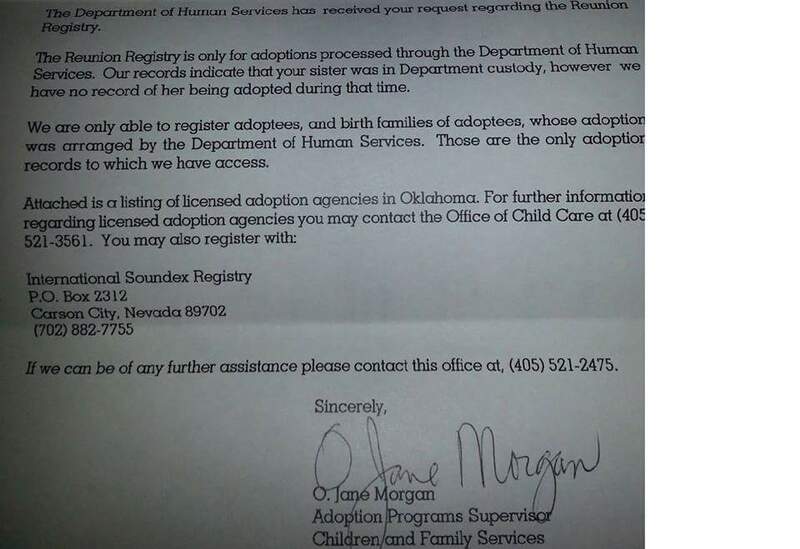 There they do have confirmed a hand-written record of her being put into Tulsa DHS custody and that is where our paper trail ends. It was years later we learned about the Lloyd E Rader Facility in Sand Springs, OK. We also have an envelope showing the return address she sent a letter from which read Rt 2 Box 9 Sand Springs, OK. Later confirmed to belong to a Bonnie and Jim Johnson. We are currently seeking Jim (James Robert Johnson) to see if he has any recollection of her; Bonnie has denied knowing who she was. A few inside people at DHS have searched through records to try to find a match coming up with nothing. We have also learned that Whitaker files before 198(?) were destroyed in a flood. Currently there is a search service actively looking for her. Social media sites and pages that are helping to spread the word. Patty has missed so much and we have missed so much without her. She would have known of three possibly four other siblings at the time she was sent to North Dakota. she was just sent to live w/family. If you have any information about Patty, please go to the”Searching for Patricia Lynn Taylor Facebook page,” or leave an anonymous tip here. Missing Persons of America’s share of your story. Your welcome! Thank you for sharing my sister’s story. There was an “S” tattoo on her right arm, birthmark on her right knee in the shape of a small circle, and an old scar on her right thigh where she’d been cut. I want to confirm green eyes instead of hazel and she DID have braces. 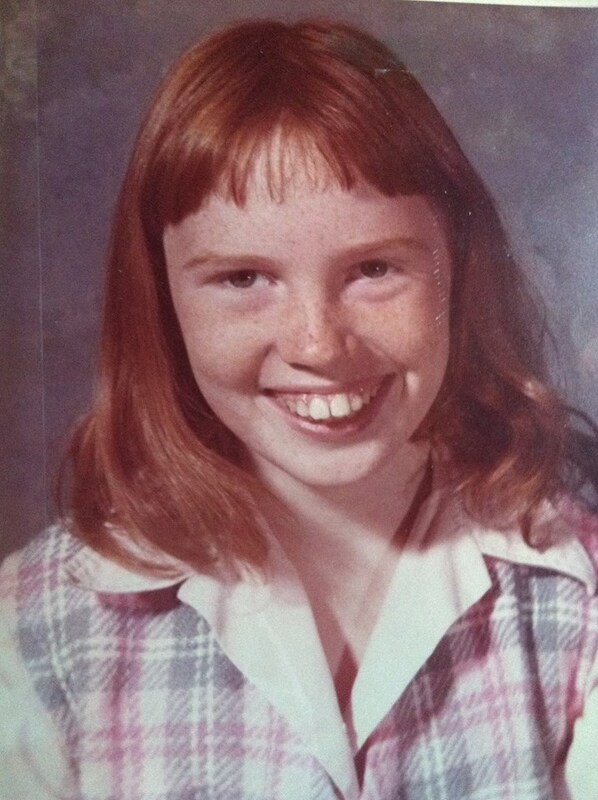 Tulsa Girl’s Group Home July 1981 to August 1981 then she ran away. Case was closed with DHS in December of 1983 when she would have aged out.